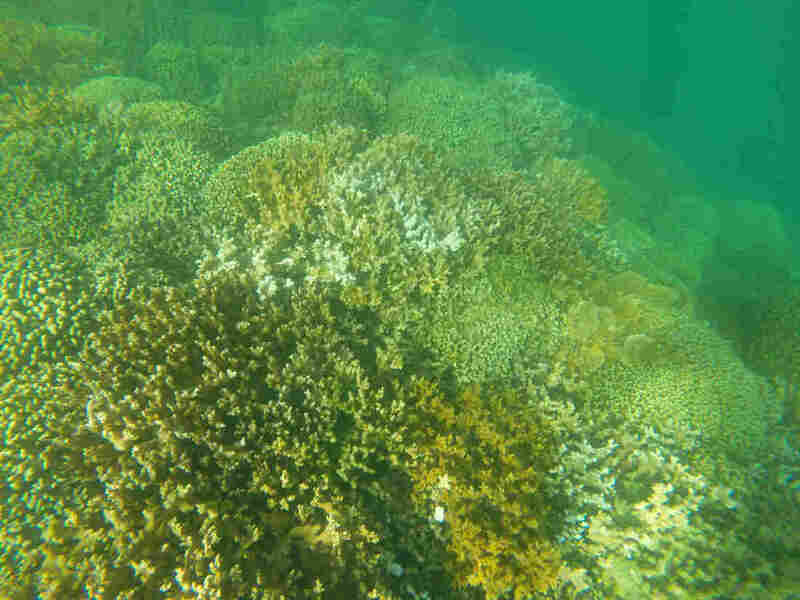 Chemicals In Sunscreen Are Harming Coral Reefs, Says New Study : The Two-Way Researchers found that the oxybenzone in just a single drop of sunscreen can wreak havoc on fragile coral reef systems. Reefs all over the world are at risk. Partially bleached coral in Kaneohe, Hawaii. Coral reefs worldwide are at risk of damage from the suncscreen ingredient oxybenzone. New research about sunscreen's damaging effects on coral reefs suggests that you might want to think twice before slathering it on. The ingredient oxybenzone leaches the coral of its nutrients and bleaches it white. It can also disrupt the development of fish and other wildlife. Scientists conducted the new study in the U.S. Virgin Islands, Hawaii and Israel, but reefs all over the world are at risk, according to a 2011 report by the World Resource Institute. While destructive fishing, pollution and development all pose threats to the coral reef, the study reveals that sunscreen is a serious danger to the health of coral. "The use of oxybenzone-containing products needs to be seriously deliberated in islands and areas where coral reef conservation is a critical issue," co-author Craig Downs said according to the Washington Post. "We have lost at least 80 percent of the coral reefs in the Caribbean," Downs said. "Any small effort to reduce oxybenzone pollution could mean that a coral reef survives a long, hot summer, or that a degraded area recovers." Local economies also depend on the tourism that coral reefs attract. As a result, some local businesses have started to ban the use of harmful sunscreen in their waters. In Akumal, Mexico, an area known for its reefs and sea turtles, visitors are warned against wearing sunscreen and are restricted to certain areas to prevent too much disruption of reef life. But damaging sunscreen from beachgoers is just part of the concern. Anytime people wear sunscreen, it's going to wind up in the waterways when they clean it off, just like harmful chemicals in household cleaning products that are washed down drains and into the sewage systems. "People come inside and step into the shower. People forget it goes somewhere," co-author John Fauth told the Post. So how can you avoid harming coral reefs without allowing the sun to damage your skin? The U.S. National Park Service for South Florida, Hawaii, U.S. Virgin Islands, and American Samoa recommend using "reef friendly" sunscreen (those made with titanium oxide or zinc oxide, which are natural mineral ingredients) and wearing clothing and hats to protect the skin from the sun.